UW-Green Bay’s Richter Museum of Natural History collections are available for artistic as well as scientific research. 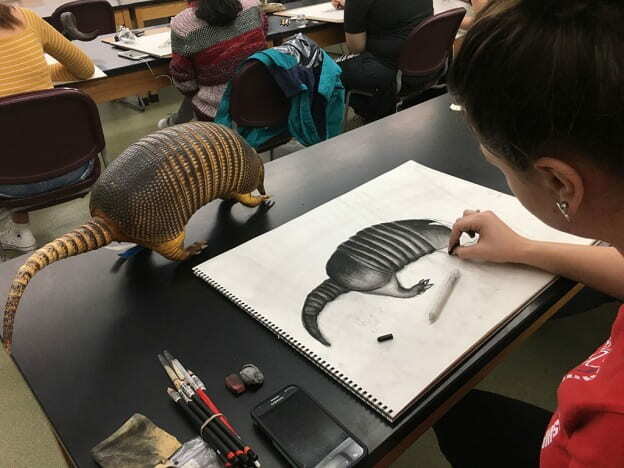 The natural forms make excellent subjects for drawing students. “If someone asks you what natural history museums have to do with art, you probably think of cave paintings and other prehistoric artifacts, right? It’s true. One of the things natural history museums do is house and interpret prehistoric art, but here at the Richter, even contemporary artists can make use of all the museum has to offer. This is the first of the Richter Museum’s new video series, Carl’s Collections, named after museum namesake Carl Richter. Richter, a former resident of Oconto, Wis., and one of the state’s most prominent ornithologists donated a collection of eggs that is one of the 10 largest oological (egg) collections in North America. The Richter Museum is primary a research museum and is usually not open to the general public. The museum display hallway and the “Gathering Room” across from the Cofrin Center for Biodiversity offices feature specimens from the museum and herbarium collections and are open anytime Mary Ann Cofrin Hall is open. The curators also conduct a number of tours for groups, such as college and K-12 classes, naturalists, teachers, Learning in Retirement, civic clubs etc. If you would like to arrange a tour of the museum for your class or group please contact Curator Dan Meinhardt at the address below for more information. This entry was posted in Close-ups and tagged Art, Center for Biodiversity, Richter Museum on June 27, 2018 by Kimberly Vlies.